Cape Town Fishing Charters is owned and operated by myself Capt.Steve Potter and my son Capt.Joe , we have collectively been fishing these waters off the southern tip of Africa for over 50 years . The canyons where we fish are where the Indian and the Atlantic Oceans come together creating a nutrient rich boiling pot of rich currents and diverse sea life . Cape Town Fishing Charters offer a variety of different fishing trips out of the picturesque fishing village of Hout Bay . 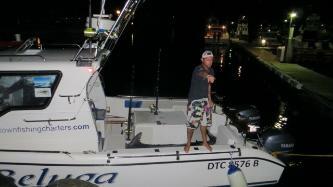 The most popular charter being our offshore Tuna fishing , with Yellowfin Tuna upto 100kgs being expected on each trip. Our season runs from October thru to June , during this period the Tuna bite is "HOT" , but if it is Marlin you want to target then the Big Blacks are here in good numbers in December, January and February. Check out our FB page to get a clearer indication of what the Cape Town Fishing Charters team are all about, scroll through the years and get in the mood for catching fish !